I have been testing Peppermint OS and absolutely love it. I have no problems running it as a live image from a USB drive on a old netbook. But when I install it to the hard drive the system won't boot up. See the image below for more information. Can anyone give me some tips or pointers on how to fix the issue. It's great to be talking to an Admin, thank you for helping me. Here is what I see when I run the command. Hi luke, how's it going ? I need to advise you, we are no longer accepting terminal screenshots or hosted images as feedback, unless there is no other option. They're difficult to read, the content can't be accessed using the forum's Search feature and they're not copy and pastable. Also too many times the image is removed from the hosting site. This renders the whole thread useless for future inquiries. It makes the thread a complete waste of time for the devs helping out . Could you please rerun the requested terminal command? Here is the copy and paste of my terminal after running inxi -Fz. Okay I'm pretty sure I know what the problem is, but I need the output from a command before I can give detailed instructions for the fix. Was peppermint installed with the usb data traveler attached ? into the terminal window and hit enter. Post the output back to the forum. Remember Linux is case sensitive. It's always a good idea to Copy & Paste commands into the terminal window. It's a lot quicker too . When PCNetSpec says he's pretty sure what the problem is. It usually means he already knows the solution. He's PeppermintOS's lead developer, so you're in very good hands . Hang in there, you'll be up and running soon. Look at it this way, you're learning a lot about your system. That's very cool . Edit: I almost forgot. Many thanks for amending the screenshot to a code feedback. It's really a huge help for future visitors . Yes it was installed with the USB attached. I tried powering down and booting without the USB attached but I still get the same issue. Thank you for you suggestion though. @AndyInMokum, thank you for all the positive and helpful feedback. Having a forum mod like you makes the experience of using these forums so much easier and more enjoyable. I just want to say a massive thank you for all the help you have given me. 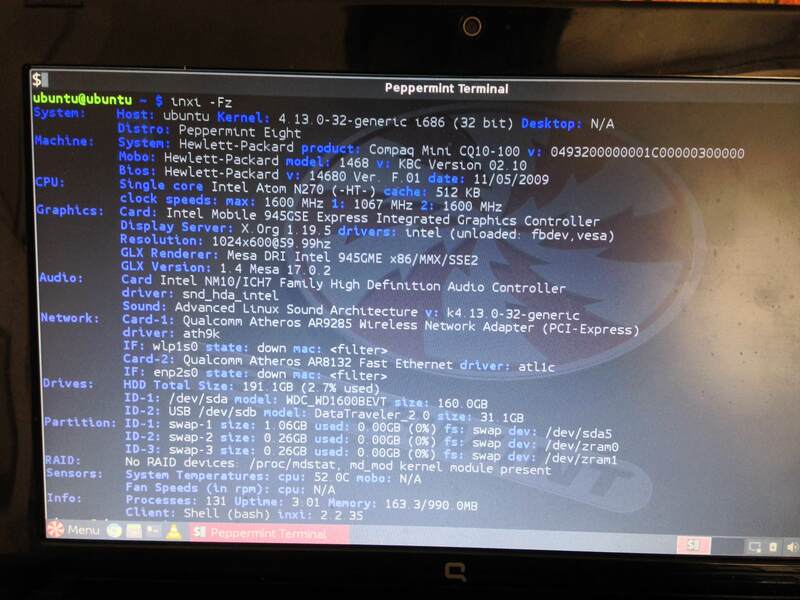 I have noticed this is an N270 with intel 945G graphics chip .. so I'm wondering if this is that weird bug that affects netbooks with 1024x600 screens. 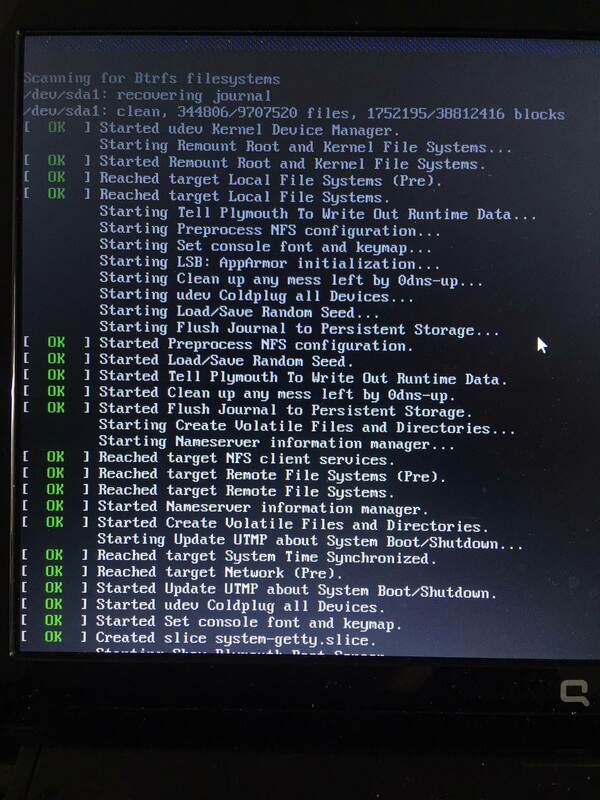 What exactly happens when you boot normally (after installation) .. is the screen all garbled ? In nano, scroll to the bottom using down arrow key. then hit Ctrl+X .. then Y .. then Enter (to save and exit nano). when that completes, hit Ctrl+D (to exit the chroot environment). Now reboot to the HDD to test. It's my pleasure buddy . We want all of our users, new and old to enjoy using Peppermint as their chosen OS. We're one of the smaller distributions. This gives us a huge advantage over the larger distros. Unlike them, we get to know our users on a more personal basis. We want our users to feel comfortable using the forum. We don't consider any question dumb or stupid. We all like to help each other out, when it's needed. This is the way we generate new ideas and grow. We pride ourselves in providing working solutions, that are easy to follow and implement. Our new users are just as important as our bearded, seasoned veterans . I came to PeppermintOS at the back end of Peppermint Four. I was a really green and clueless nOOb. PCNetSpec (Developer) aka, Mark Greaves' "hands on" approach to user support, taught me a huge amount about Linux. Just what you're doing with your machine at the moment, is giving you an insight into how it works. You'll very soon get to appreciate the flexibility and versatility of Linux. It's a really impressive achievement . The Peppermint forum is a very cool place to not only get advice . It's a great environment to learn about Linux in general . If you haven't already done so. You should check out the, Official Tutorials and the, User Submitted Tutorials. There are loads of very useful and fun things to do to your system. The list is always growing too. Once your up and running and are feeling more comfortable with your system. I highly recommend trying some of the things contained there . The key to learning Linux is not being afraid to ask questions. You'll always find someone here willing to answer them. Another thing to remember, is always have fun with your system, make it yours . Those commands worked. But I'd love to know what was the issue and what did we do the resolved it. Are we mounting the hard drive so the OS can see it? We are doing something to the Grub system, I think of the Grub as the 'boot loader' but Im not sure if that is correct or even what is going on here. I would be good to know what the issues was and what we did to fix it. Again thank you for the warm welcome @AndyInMokum I certainly feel like I am enjoying Peppermint and using the support forum. This forum has been very welcoming to me and that is what has made me stick with using Peppermint OS. I feel like I have been guided by your self and @PCNetSpec really well, and not only that my issue has been resolved. I have grown to love Linux via using the Raspberry Pi so I already know a very small amount about Linux and using the command line, but I am hungry to learn more as I am just scratching the surface and I know there is more useful things I could be doing using Linux. I am now in the process of customising my Peppermint installation so that it is perfect for my use case. I have posted a couple more posts in the fourm and hope you might drop by and comment on them.